2008 was when Shreve from Daily Coyote told me to go for it… start my own blog… and I did. That first year I wasn’t consistent until fall when, after another cup of coffee at the cafe, Shreve told me to be dedicated. I stepped it up… and barring slow or non-existent internet, family emergencies, and extreme exhaustion, I’ve been here every day. 2,651 entries. I’d say that deserves a #farm365 hashtag! Red Dirt In My Soul is on Facebook, Instagram, and Twitter (rimrockes). Sure, sometimes it’s just a photo… but that is worth a thousand words, so I don’t consider them as total failures… My once a week Wordless Wednesday is my “vacation”. I have posted 143 videos on the internet. (Check them out through the video tab at the top of this page) I have many friends, old and new, that have helped me, encouraged me, gave suggestions, and cheered me up. You’ve been here through my kids education and graduation from college, their marriages, their 7 kids! You waited while I sat by my mom’s side as she lost a short fight with cancer. You laughed at puppy antics. You learned about cows and horses and calving and dogs. You admired the landscape of Wyoming. You gave advice about my house remodel and my studio project. You watched me learn about honeybees. You liked my crafts and my passable artwork. You even like my “real writing” when, on occasion, my words replace my photos. This has been very fun… my “photographic journal of life on a Wyoming Centennial ranch”… and it’s due to you. I didn’t get rich or popular doing this, but it’s become such a part of me, I don’t know how to stop. Some of the reason I do this is to AG-VOCATE… advocate for agriculture… even though I usually stay away from controversy. I figure if you know America’s farmers and ranchers are out here, working hard, trying to do our best… and you got to know us… or, at least, ME… then maybe some common ground can be found and when someone tells you how horrible ranchers are, you can say, “Well, I know one, and her family isn’t horrible!” That’s a start. Every day. It’s a new start. Do it over. Do it right. I’m so very thankful for all of you. God has blessed me. I hope he blesses each and every one of you. Thanks for reading! and, now…. I had 68 eligible entries for the Red Dirt calendar. 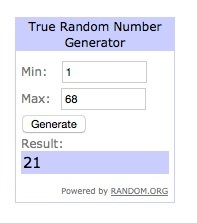 A random number generator picked number 21! The 21st comment by days’ entries, was GD who encouraged me about my “hoarding” by stating “I keep “stuff”, too! You never know when it comes in handy. The trick is to not get too much and to keep it all organized.” There, ya go! You win! We will be in touch! Now, we all know you all are winners… so I’ll run a special discount on my calendar for the next few days before it’s taken down for the year. Follow this link and order your own copy for a special discounted price! Thanks to everyone who entered! Wow, well and truly. I have only been with you a couple of years and always enjoy your posts, though rarely comment. One day I shall go back and read your older posts and pics and videos. Keep it up. Love the sentiment expressed in this, have seen first hand how busy you are, your cheerful outlook, and that you are the personification of “attitude is all”. Have never seen/heard you be short, rude, or speak ill of anyone or thing. You inspire, teach and keep on keepin’ on. It takes courage to share so much of yourself on a constant basis. Oh my God, that was so sad and beautiful. I only found you in 2014, but have caught up with your family via your Twitter posts. I love your photos, stories ( you on the roof and no one around to get the missing tool), videos and crafting. You brighten each day as I learn what’s happening way out west across the pond in Wyoming. Thank you. Yes, beautiful scenery, animals and good hard working people and great stories… that is where it is….